Guelph Public Library staff are working to update and improve our Blogs. In order to do this we are ceasing our posts for a few months. In the late summer, early fall, we will be creating one GPL blog that reflects our new branding. Hope to see you when we return. You might wondering about that original marriage certificate your grandmother gave you. How do you protect such an important genealogical document? I ask this question because I have such a document that I proudly stuck in photograph album when I was sixteen (see photograph below). Now you might be thinking that’s a wonderful idea. Unfortunately this is not necessarily the best approach to care for a historical document. Rather than “sticking” that document in a photograph album a better approach may have been to encapsulate it using a polyester film that’s chemically inert and acid free. Although not suitable for conservation treatments, encapsulation does protect paper documents and related materials from dust and dirt. In addition, encapsulation allows others to handle and view the document. The process of encapsulation can be easily reversed unlike a laminated document or a document in “sticky” photograph album. You may have such albums at home with photographs or documents that are kind of “glued on” to the album page. It’s not wise to force them off the album page as you could damage the document or photograph in question. Having taken some classes over the last few years, I have learned that encapsulation works for letters, maps, posters, newspaper clippings and even photographs (at least in some cases). However, it’s not so wise to encapsulate a charcoal drawing. Some materials are just not appropriate for encapsulation. You will need materials to encapsulate documents and a basic kit containing everything you might need can be purchased. You will also need a clean work area. In my defense I was only sixteen when I stuck that marriage certificate in a photograph album. My high school did not offer courses on the preservation of records. On the plus side, if I can suggest there is a plus to what I did, the marriage certificate is situated in the album where its placement helps tell the story of my family’s history. Now you know a little more about encapsulating important genealogical documents. If I can help further just let me know. I can provide some basic instructions on the process. In fact, this Saturday I will be demonstrating the process during the Library’s “How To Festival.” See you then. You may no longer receive your Guelph Mercury at home, but the Mercury is not lost despite its closure earlier this year. It still exists at the Guelph Public Library. In my experience as an Archivist / Librarian, I see how it serves our customers in a multitude of ways. Customers often use the local paper to look up articles about businesses, individuals and other topics. For genealogists the Mercury is used to look up obituaries, births, and marriage announcements. For others the Mercury is useful to research a business for advertisements placed in the local paper. In one case a local author sought and examined poems submitted to the local paper that he later republished. We also have many of the original photographic negatives and prints taken by the Guelph Mercury over the years. Our customers can view many of these images online. The photographs were taken to support newspaper stories and have value for research purposes. Customers make use of our “Search the Archives” feature to locate old photographs. It may be a photo of themselves at a hockey event, a wedding or of a relative celebrating an important anniversary. We might even have a picture of the house you or a relative grew up in. By request, the library will provide high resolution copies for a few dollars. This photograph shows a group of farmers on a tour of the Guelph Mercury. This photograph was taken 1961. Photograph appears courtesy of the Guelph Public Library Reference code F45-0-5-0-0-22. The Guelph Mercury has closed, but the paper is still a valuable resource and will continue to be so for the foreseeable future. In fact, I can guarantee that tomorrow or may be the next day we will receive a reference question by email or phone where the Mercury just might be the resource that provides the answer. Naming your digital files may not seem like an important task when you first create them, however, establishing some basic naming conventions will help you access your records more effectively. Operating systems like Microsoft Windows allows you to name files you create or receive from word documents to digital photographs. By convention I simply mean establishing basic rules to guide you in the naming of your files. The idea behind this is to create meaningful file names. Meaningful enough that you can browse your files without opening them. Also you will be less likely to delete a file that you spent some time thinking about and organizing for better retrieval. Some things to keep in mind when naming files. According to Rizzo, avoid using the equal and or plus signs (54). Rizzo also suggests that you do not add a space in our file name but rather an underscore to represent a space (54). If the chronology of the electronic record is important than use the year, month, and day format combined with meaningful keywords (Duffy, 3). Moreover, do not use characters like @, #, $, %, > among others. It may be confusing to you as they have the own meanings. Although I am not technical expert, your operating system might refuse the use of some characters. Below are two resources I consulted which are available through our subscription databases. Duffy, Jill. “Managing Video Files.” PC Magazine Digital Edition October 2014: 1 – 6. Academic Search Premier. 5 December 2015. Rizzo, John. “Living in a Windows World.” Macworld 08. 2006: 54-61. Academic Search Premier. 5 December 2015. This holiday season why not check out some of Christmas displays in your neighborhood. It can be a fun and inexpensive way to experience a little holiday cheer. I have done this in the past with my Guelph bus pass. Just simply board a city bus and take an unofficial tour. Depending on the weather you might consider walking along your neighborhood. Alternatively you might take a tour of our photograph database. Over the years the Guelph Mercury has taken photographs of individuals and their Christmas displays. The photograph on the right shows Ernest Stahlbaum with his Christmas lawn ornament display. Another photograph taken December 1976, as seen on the bottom right, shows a residence with a decorative display that won the Kinsmen Club Christmas lighting contest. This year you might wish to venture to the central library at 100 Norfolk Street. The building will look quite festive with lights, a Santa and elves. In the past staff have also performed some Christmas carols. It all helps to spread some Christmas cheer. Photograph appear courtesy of the Guelph Public Library Archives, Christmas Display, 1980, F45-0-1-0-0-902. Photograph appears courtesy of the Guelph Public Library Archives, Decorated Home, 1976, F45-0-7-0-0-702. This photograph is of my uncle who served in the Infantry during World War Two. 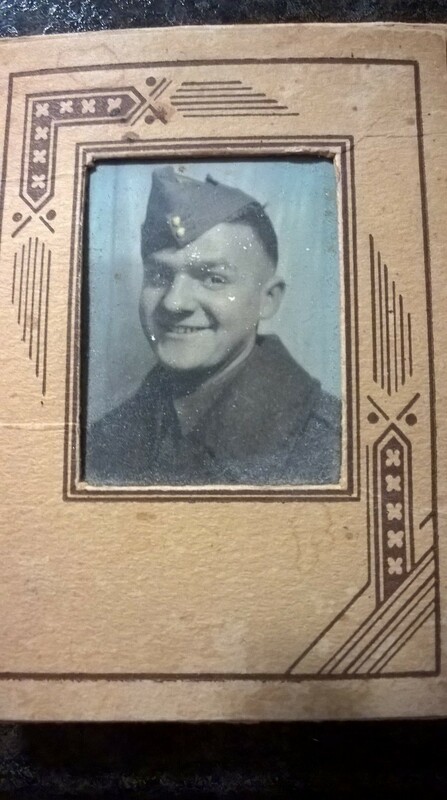 With Remembrance Day approaching I thought I would write about one of my relatives who served in the Second World War. In particular Cliff Hiltz my late uncle. Genealogy is often about finding sources that can shed light on your family’s history. They need not all be primary source documents. I know my uncle served or enlisted with the North Shore (New Brunswick) Regiment. That’s about all I knew and that information was based on the book We Remember the Veterans of New Ross, Nova Scotia. I have since found additional information in a book entitled Canada’s Army in World War Two by F.R. Tripp. According to Tripp, the North Shore Regiment mobilized on May 24, 1940 and left for the United Kingdom in July the following year. The Regiment participated in the Normandy Landing with the 3rd Canadian Infantry Division among other operations. If I understand correctly the Regiment eventually disbanded in April of 1946. Although this may not seem like a lot of information, it does provide additional details I had previously not known. All I did was spent time at a local library where I live looking through some secondary sources related to the Second World War. Sometimes browsing the library shelves can be a relevant means of research. I encourage you visit your library to learn more about your relatives who have served. The book I mentioned above is available at the Guelph Public Library. In June of this year, I visited Inverkip cemetery in Greenock, Scotland were John Galt is buried. You can read more about my visit in a previous blog post. For genealogists and family historians visiting a cemetery requires some preparation. Below are a few tips I have picked up either by experience or by reading on the subject. 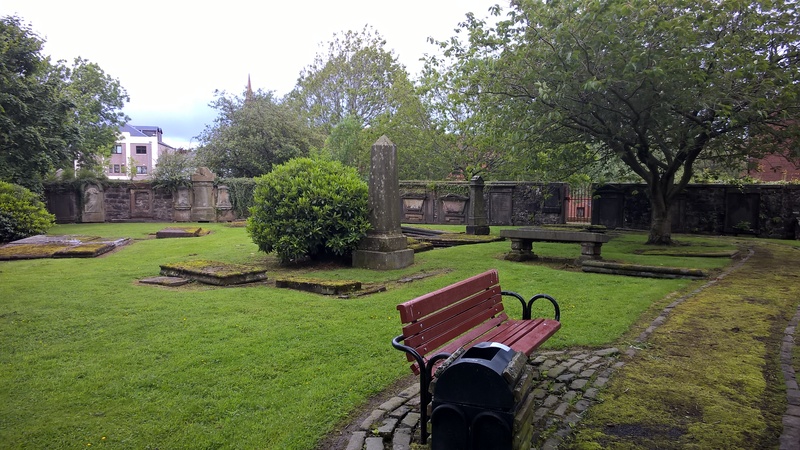 This photograph is of Inverkip Cemetery. John Galt is buried here. If you expand the photograph you can seen how some of the tombstones are covered over. Photograph courtesy of the blog author. First, bring along a camera. That’s probably obvious, but it’s worth mentioning. While I was in Scotland to visit John Galt, I used my smart phone which is capable of producing good quality digital photographs. Secondly, grass cutters are also handy to bring along on a trip to a cemetery. Grass can grow up around a gravestone and the only way to effectively view it is by cutting the grass that partially covers it. I found this to be the case with John Galt. Mind you I did not cut any of the grass or plants surrounding John Galt’s grave nor did I pack any grass cutters in my suitcase. A third idea you might consider is wax paper. One can use wax paper to do a tombstone rubbing of any inscriptions. I did not feel that I needed to go to such lengths with John Galt’s tombstone, but I suppose I could have. Lastly, if a tombstone is hard to read consider using some water. The application of water can make a tombstone more readable. It is important to remember to be mindful of anything you might do while visiting a cemetery. No one wants to cause further damage to fragile tombstones by doing a rubbing or wetting it. I would suggest checking with the respective cemetery first on what may or may not be allowed. Now it’s time for you to go and explore.